The evolution of instinctive behaviors is one of the most mysterious phenomena in nature. There is no understanding of the genetic basis for instincts. 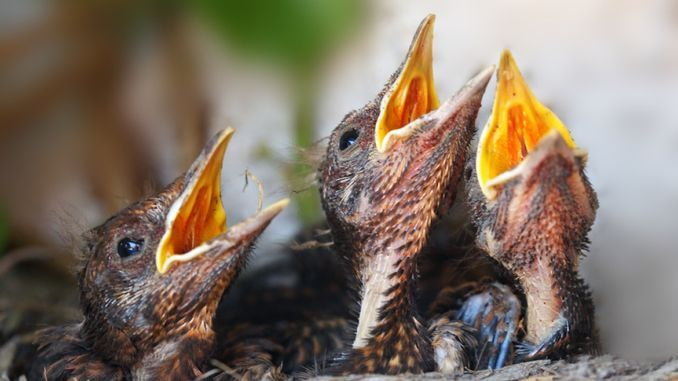 It is currently believed by many biologists that instincts are the result of the transmission of learned behavior from ancestors, which somehow became hardwired into the DNA of modern species. In other words, evolutionists believe in biologic impossibilities. In explanations of evolutionary processes, it is often assumed that symbiotic behavior is entirely predictive of evolution, since a survival benefit is derived by both species. However, the evolution of such complex behaviors cannot be ascribed to known mechanisms of natural selection. In virtually all proposals of evolution, the only barrier that is considered is change in anatomy. This represents an astounding omission, given the fact that instincts are vital to the survival of every animal species. The cleaner wrasse is a small fish that feeds off debris found in the mouths and gill compartments of predators. The cleaner wrasse, a small fish of coral reefs, obtains nutrition by scavenging parasites and detritus from larger potentially dangerous fish. It goes about from one species to another feeding off the debris found in the mouths and gill compartments of other species. The recipient of the cleaning opens its mouth and flares out its gills to allow the creature access. Such a process might seem simple enough at first glance. 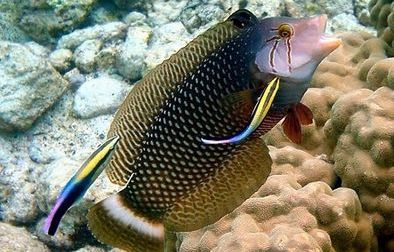 The behavior benefits both the cleaner wrasse and the fish which it cleans. Thus, it might seem obvious that the recipient species would cooperate since a benefit is received. However, closer evaluation reveals enormous challenges to evolution. 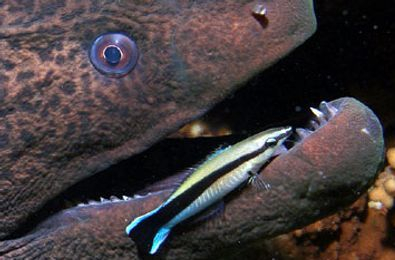 Despite the fact that many fish could quickly devour the intruder, the cleaner wrasse is allowed to perform its cleaning and obtain food, presumably because it benefits the recipient of the cleaning. In describing how such a process evolved, it is imagined that the DNA of the wrasse gradually became hardwired for that behavior by the need to obtain food. What is unexplained is how the receptive behaviors simultaneously became encoded into all of the species which it cleans. It is sometimes forgotten that fish and other lower forms of animal life are not very intelligent, and are driven by instinct. They do not readily learn through experience and pass such knowledge on to offspring. If such behaviors are not encoded into its DNA, the fish will not do the cleaning. 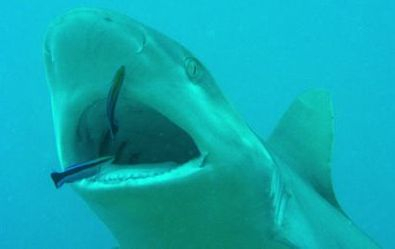 If the receptive behavior is not encoded into the DNA of the larger fish, the smaller fish will be eaten, regardless of its intentions or the long-term beneficial effect of cleaning. If the wrasse evolved the cleaning behavior and the recipients didn't evolve the behaviors to receive the cleaning, the fish would not be aware that he is not welcomed and would quickly be driven to extinction. In proposing the evolution of cleaner wrasse behavior, it must be understood that identical receptive behaviors would have been required to evolve independently in moray eels, snappers, groupers, sharks, and hundreds of other species. 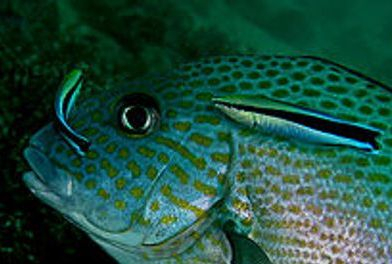 These behaviors purportedly resulted in the allowance of the wrasse to enter the mouth and gill compartments of larger fish. If any one of these potential predators failed to evolve the receptor behavior, the cleaner wrasse would have quickly faced extinction. The evolutionist views these complex interactive behaviors between species as evidence of evolution, because each species derives benefit from the other, mutually promoting the survival of both species. However, no thought is given as to how such complexities of behavior could have evolved by the mindless short-term pressure to survive. 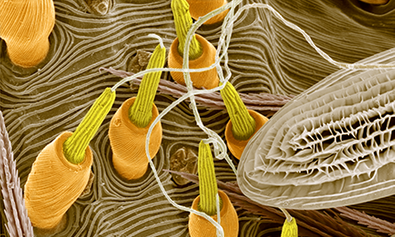 Complex silk glands of a spider as seen through an electron microscope. Intricate web of a spider. The spider's capacity to create a web is readily accredited to evolution, because a web enhances the survival of the spider. Consider the complexity of the spider's silk glands, which enable the creature to create strands of silk with a tensile strength of five times that of piano wire. How could random mutations create complex biochemical pathways to result in such an endpoint? 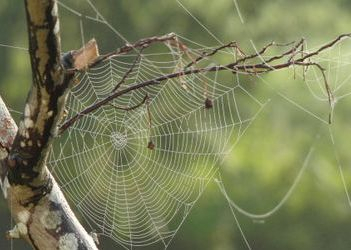 Even if such an organ could evolve, it could not be construed as a survival advantage without the co-evolution of the corresponding instinctive behavior to enable the spider to create an intricate, symmetrical web. Such an instinctive capacity requires a digital "computer chip" to be hardwired into the spider's DNA.